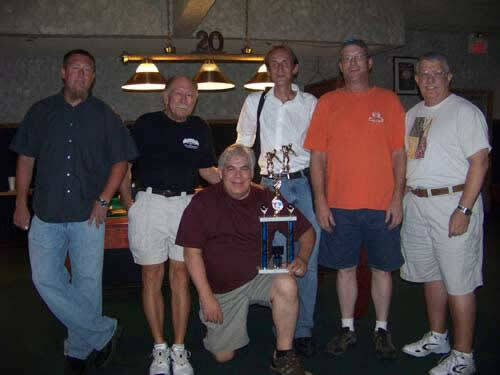 Congratulations to the 2011 Vegas Masters 8-Ball State Champions, Horse Shoes & Hand Grenades of the Las Vegas Cue Club! 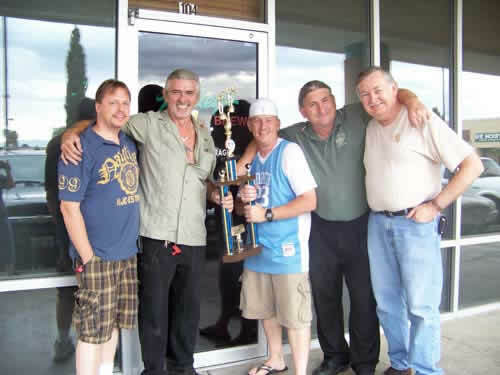 This team won the opportunity to compete at the 2011 TAP League Nationals, a 4 night stay at Bally's, attended the exclusive TAP National Welcome Party and now sport a big beautiful trophy. It doesn't stop there....the team also traveled to Philadelphia to compete at the Rally in the Valley dream team competition! Congratulations also goes to Gimme' A Break for winning 2nd place and to The Good, The Bad and The Ugly for winning 3rd place. Both teams play out of Mickey's Cues & Brews. 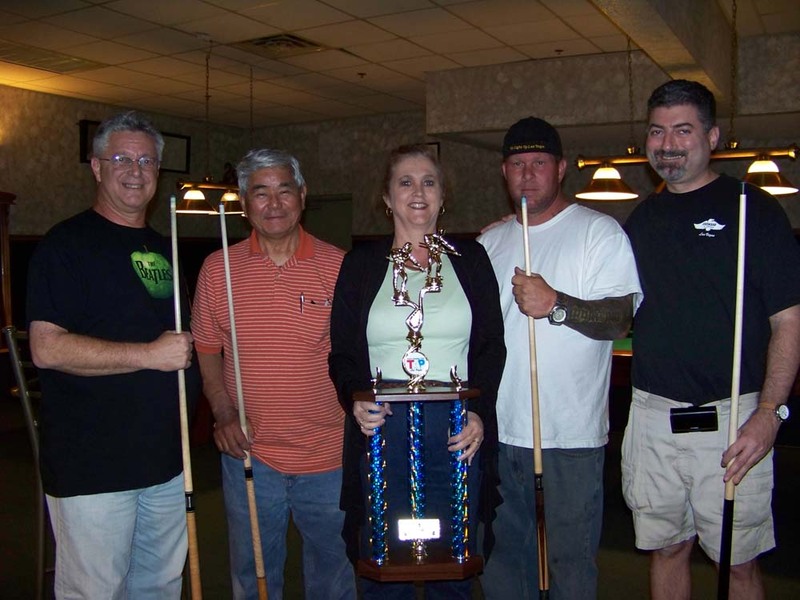 All three of these teams advanced to compete at the 2011 TAP League Nationals 8-ball team pool tournament at Bally's. Congratulations to Brothers for Life for winning 1st place and to 14 Balls and A Hole for winning 2nd place in the Best of the Rest! So the story goes.......Day 1 & 2 - The 5th Annual Vegas Masters 8-Ball State Championship & National Qualifier began July 23 & 24. With 27 teams (144 players) competing and over $10,000 being awarded, this tournament has become the largest locals only team tournament in Las Vegas. Charles Medeiros was the undefeated top shooter in the round robin with 6 of 6 possible match wins! Also on the undefeated list are Danny Dietrich, Harold Shimojo, Theo Taylor, Drew Stokes, Reese Romney, Kelly Seeley and Norberto Davila with 3 of 3 possible match wins! Other great shooters included Kris Winn on 4 teams with 5 wins and only 2 losses and Joe Gregory with 3 wins and 1 loss. The top teams included Faded Eights out of 7-11 Bar, That’s How We Roll and The Gin Runners out of the Gin Mill Casino. These teams earned 12 out of 15 possible points! The top 50% (plus ties), 17 teams, moved on to compete in the Championship to be crowned State Champion, receive an entry to compete at Nationals, a 4 night stay at Bally's on The Strip, an invitation to the exclusive TAP National Welcome Party and a chance to travel to Pennsylvania to compete at Rally in the Valley and a great big beautiful trophy! These prize packages hold a value of nearly $10,000! The remaining 10 teams moved on to compete in the Best of the Rest for a chance at winning $1,100 in CASH! On July 30, teams began competing for the Championship and Best of the Rest single elimination tournaments. At the end of the day, 8 teams remained to compete in the semi-finals (4 teams on the Championship and 4 teams on the Best of the Rest). On July 31, the remaining teams began competing in the semi-finals of the State Championship and Best of the Rest. In the Championship semi-finals were: That's How We Roll from the Gin Mill competing with Gimme' A Break and The Good, The Bad and The Ugly from Mickey's Cues & Brews competing with Horse Shoes & Hand Grenades from the Las Vegas Cue Club. Winning and moving on to compete in the finals for 1st place were Gimme' A Break and Horse Shoes and Hand Grenades. In the end, it was Horse and Handgrades that made it to the top, the State Champions! At the same time, That's How We Roll competed with The Good, The Bad and The Ugly for the 3rd place and a chance to compete at Nationals. In the end, it was The Good, The Bad and The Ugly won 3rd place. In the Best of the Rest semi-finals were Brothers for Life from Torrey Pines competing with Break My Balls from Mickey's and DILLIGAF from Larry's Hideaway competing with 14 Balls & A Hole from Torrey Pines. Moving on to compete for 1st place were Brothers for Life and 14 Balls and A Hole, both from Torrey Pines. 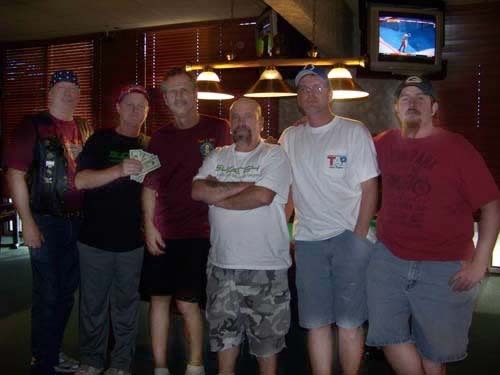 Brothers for Life won 1st place, with 14 Balls and A Hole in 2nd place. Click here to view the Championship Board. Click here to view the Best of the Rest. A special thanks to our referees who contributed their services: Eddie Harvey, Normand Thibodeau, Kelly Ashe, Jeremy Head, Gerald Branham, Mark Mahon and Chris Bottorff. 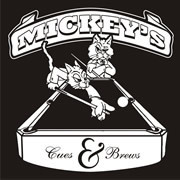 Thanks also to our hosts at Mickey's Cues & Brews: Shawn, Robin, Steve and Tony. All of these folks play a very important roll in making our tournaments successful. Click here to view all of the downloadable pics in high resolution. 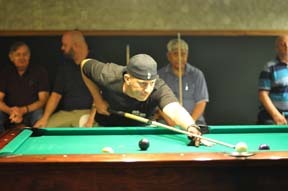 The top four 9-ball teams gathered together on Saturday, June 25 for this annual competition playing in a round robin format. Also competing were the "Cheers" team, Sharp Shooters from the Stake Out and Whatever from the Cheyenne Saloon. The competition was tight going into the final round with a 3 way tie. Pool Problem ended their triumphant day with a 5 and 0 and 1st Place. 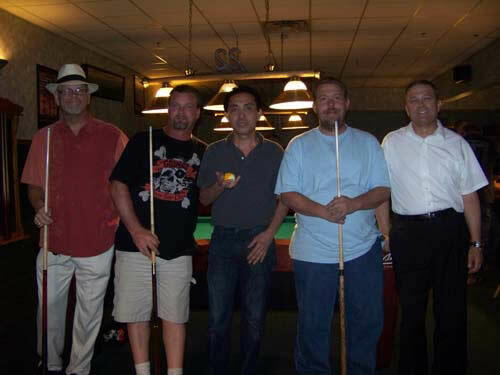 Pool Problem from Cheers Bar won 1st Place in the Vegas Masters 9-Ball National Qualifier & State Championship! Congratulations to Terry Burgess, Harold Shimojo, Debbie Dios, Glen Ivy and Dan Dayan. Click on the pic to see a full size photo. Pool Problem went on to compete at the 2012 TAP League Nationals in November at Bally's on The Strip. They enjoyed a 4 night stay at Bally's, attended the Annual TAP League Welcome Party and have a big a$$ team trophy at Cheers. All in all, their prize was $1,800. Although they didn't win, they had a blast! 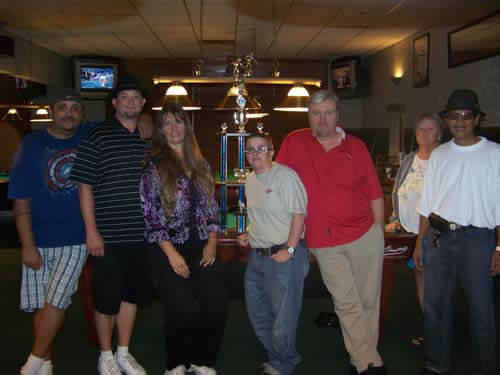 This team and Sharp Shooters tied for 2nd place in the round robin and competed in a single elimination tournament to determine who would advance and compete at 2011 TAP League National 9-ball tournament. Congratulations to Whatever for their victory!